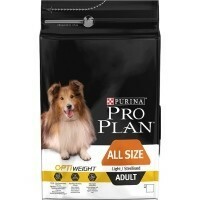 Purina Pro Plan OptiWeight Light/Sterilised Adult Dog Food is a specially formulated; complete balanced dog food for overweight dogs or those that have been sterilised. Proven to be effective for healthy weight loss and weight management, Purina OptiWeight Light/Sterilised is suitable for adult dogs of all sizes and will help your dog achieve and maintain a healthy body weight, thanks to its high protein, low fat and adequate fibre levels. As part of a healthy dog diet and exercise routine, Purina OptiWeight can help your pet achieve his weight goals whilst still providing all the nutrients they need for their day-to-day activities.